Electric bike popularity is booming in the UK at the moment with more and more people turning to E-bikes for their next purchase. Although they divide opinion, it seems E-bikes are here to stay and can only get better! 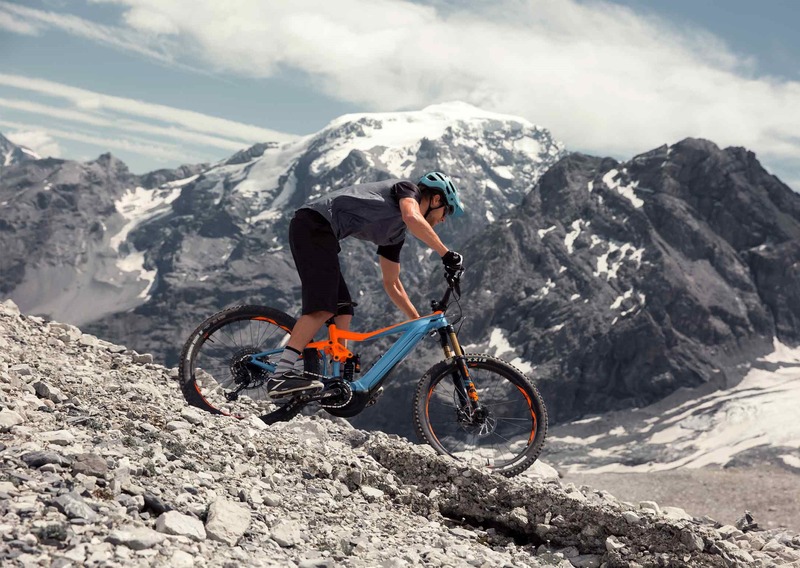 Completely new for 2019, Giant have redesigned their existing mountain bikes and created electric versions! Giant have been working alongside Yamaha to fine tune their motors for use in their bikes. In the 2019 e-MTB range we have two types of motors: the SyncDrive Pro and SyncDrive Sport. The SyncDrive Pro provides 5 different support modes and is 380 grams lighter than the SyncDrive Sport. For 2019, riders can now tune the support of the motor, given you a more dynamic ride experience that matches your ability and terrain. The SyncDrive Sport comes with 3 support modes, ideal for everyday riding yet powerful enough for off-road riding. The 2019 e-MTB range from Giant and Liv all come with ALUXX SL Aluminium frames, this material is a state-of-the-art aluminium material which is made from mostly 6011 alloy. This means a better strength-to-weight ratio for you the rider. Also featured throughout the range is the RideControl One control panel located on the handlebars. The RideControl One has a minimal design with no display screen. The buttons allow you to shift through support modes easily and the LED lighting indicates your battery level whilst riding. The control unit can also connect to the Giant E-bike app giving you access to additional information. First up we have the Trance E. the Trance E is the top level e-MTB bike from Giant, made for trail and enduro riding. The Trance E comes with narrower cranks, which reduce the Q angle. What this means is a more comfortable ride due to the shortened distance between the two cranks. The Trance E comes with 27.5" wheels, the SyncDrive Pro motor and a 500Wh EnergyPak. The motor provides 360% support when in it's top mode. The Trance E is a full suspension e-MTB with 140mm front and 120mm rear travel. Within this range we have the SXE +0 Pro, the +2 Pro and the +3 Pro. As you can imagine, the SXE +0 Pro comes with the top of the range spec including better forks, brakes and shifters. With a compact delivery, the Stance E is built for e-MTB beginners and intermediate riders who want to experience the off-road trails without the need for a top of the range bike. The Stance E comes with flex point suspension, and mudguard and stand compatibility for everyday use. With its trail friendly geometry and 350% support this bike gives you the ability to tackle most terrains. The pedal plus 4-sensor technology precisely measures the amount of force a rider applies to the pedals so the motor can produce a seamless power boost. The Stance E is ideal for someone who is looking for a beginner e-MTB bike or something to bridge the gap between the top spec bike. We have the +1 and the +2 available on our store, with the +1 providing a better spec and more powerful motor. The Fathom E is a hardtail e-MTB, designed for XC and single-track terrain riding. The Fathom E comes with trail-friendly geometry, giving you greater enjoyment whilst off-road. With 120mm front travel and either 27.5" or 29" wheels, giving you better control and handling. Included in the Fathom E is the SyncDrive Pro or Sport motor, depending on the model, with a 500Wh or 400Wh EnergyPak. Fathom E +1 Pro 27.5"
Fathom E +1 Pro 29"
Fathom E +2 Pro 27.5"
Fathom E +2 Pro 29"
The specs vary throughout the range with the +1 Pro having the top of the range spec. 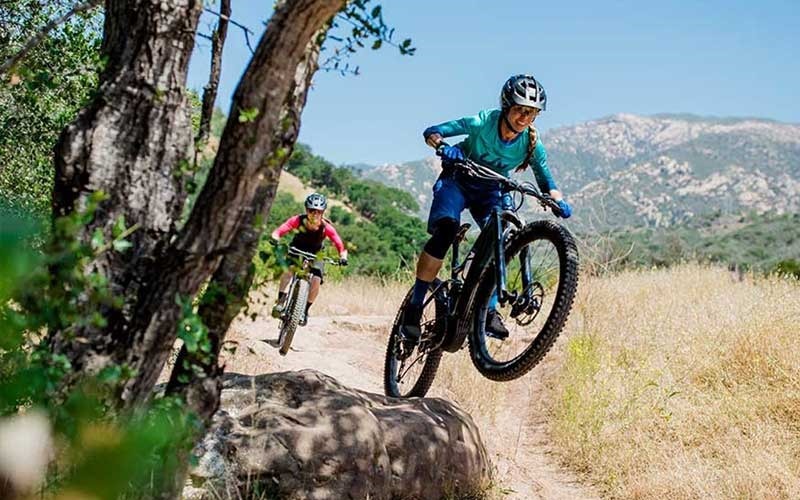 New for the Liv 2019 e-MTB range is the Intrigue E. Built with an aggressive Liv 3F frame design and 150mm front and 140mm rear Maestro suspension, the Intrigue E is built taking on the challenging terrain and manoeuvring technical sections with ease. With a torsionally stiff yet sleek lightweight one-piece carbon linkage, the Intrigue E is great for high speed descents and technical climbs. Liv bikes are created by women, for women, meaning specific geometry for a better ride. We have two different models of the Intrigue E, the +1 Pro and the +2Pro. The +1 Pro comes with a slightly better forks and brakes. The second in the Liv e-MTB range is the Embolden E, a trail bike ready to fly up those climbs and keep you secure on the descents. The Embolden E comes with the SyncDrive Sport motor and the RideControl One. Much like the Intrigue E, the Embolden E comes with the Liv 3F frame design and 500Wh motor. The travel is 130mm front and 120mm rear making the Embolden E the ideal bike for all off-raod terrains! In the range we have the +1 and the +2 Emboldens. Again the +1 comes with higher spec brakes and shifters. You can view the 2019 Giant and Liv e-MTB range in our Giant Store Rutland, Giant Store Cambridge, Grafham, Peterborough, and Histon stores.